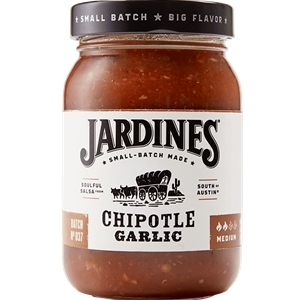 Smoky chipotle peppers and tantalizing, roasted garlic dance the salsa mambo in this unique and flavorful Jardine's Chipotle Garlic Salsa. Sun-ripened tomatoes and fresh-from-the-earth veggies deliver an award winning performance to the applause of all who try it. Truly exceptional...truly delicious! We're pretty sure you'll give it a 10! 16oz. Diced tomatoes, diced green chiles, tomato paste, fresh yellow onions, roasted tomatoes, chipotle peppers (chipotle peppers, water, tomato paste, salt, sugar, onion, vinegar), water, fresh garlic, fresh jalapenos, salt, sugar, vinegar, lemon juice, dehydrated onion, granulated garlic and spices.